Our family went "camping" last night. I use the quotes around the word "camping" because we were hardly roughing it. We weren't even in the woods. Our tent was set up on the soccer field at our church where we were within a short walk from electricity and running water. 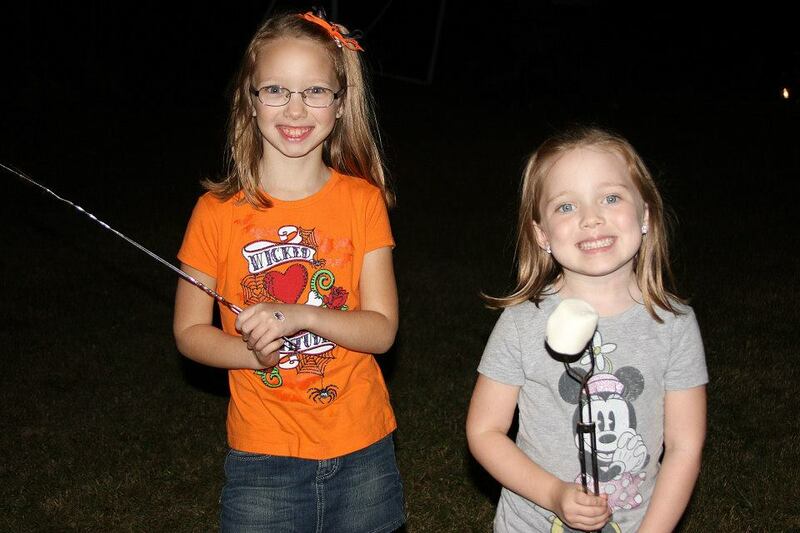 Nevertheless, there was a campfire where the kids roasted s'mores. That's really all you need for camping. Our evening also included a short devotional with songs and a lesson about wearing (metaphorical) masks. We ate hamburgers and hot dogs, and the kids watched "Mickey's House of Villains" on a big inflatable outdoor screen. Daisy actually accompanied us, and she took to camping like a pro. She was happy to sleep alongside us in our tent and had fun chasing after kids (a little too much fun, there). At our last church camping event, we missed out on staying overnight since I had been out of town and wasn't sure if I'd arrive back in time. Misty, quite sensibly, hadn't wanted to wrangle two kids and a dog while also trying to set up a tent. I'm glad we got to enjoy the whole experience this time. We had a great time there with our friends.